Members of the women’s basketball team volunteer at Crocker Farms Elementary in Amherst. 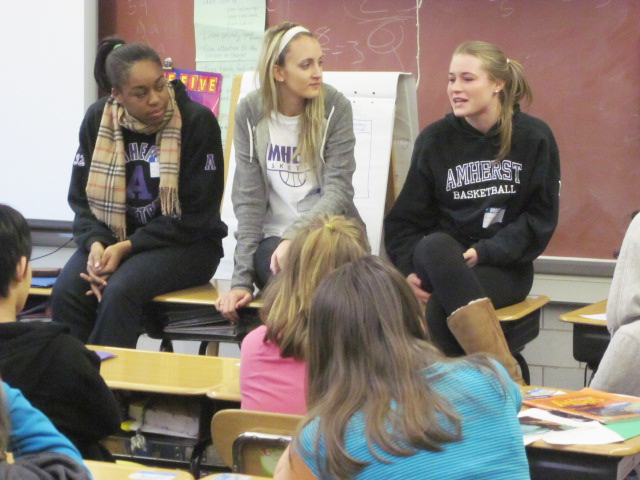 On Jan. 18, Amherst College students, student-athletes, faculty and coaches traveled to Crocker Farms Elementary School to participate in the second annual Amherst College Day. “The thrust of Amherst College Day is to tell kids from grades 3-6 that college is more than just a possibility,” Angela Mills (one of the organizers of the event and wife of Amherst’s head football coach EJ Mills) explained. The principal of Crocker Farms, Mike Morris, is an Amherst alumnus who originally spearheaded the day to start an important conversation between his students and college students. Amherst’s participants included the crew team, the track and cross country teams, men’s tennis, men’s lacrosse, men’s soccer, women’s basketball, football and members from the Psychology, Chemistry, and Economics departments. Through numerous small group activities that ranged from lacrosse lessons to neuroscience experiments, students and faculty all shared their perspective on college life and offered sage advice on the process and importance of getting there. “The day really humanizes the college experience for the kids,” Angela said. She offered the example of the women’s basketball team, who led their group in a discussion about what makes college cool. Among their top reasons were: taking classes that interest you, getting to try new things and last, but certainly not least, the absence of a predetermined bed time. The morning was headlined by men’s lacrosse head coach Jon Thompson, who spoke about the benefits of a college education, diversity and the vitality of pursuing one’s interests. Two of the teams that participated in Amherst College Day, men’s tennis and football, decided to establish a more lasting relationship with Crocker Farms, offering to volunteer every Wednesday for Crocker Farms’ after-school program. Students are released about an hour and 20 minutes early from school on Wednesday afternoons as part of a system to create enrichment time for teachers. This led to an opportunity and necessity for an after-school program that would provide students with a safe, fun and educational environment in which to spend that time. “Wednesday Clubs was started about three years ago by Erika Zekos, an architect in town whose kids attended Crocker,” Angela explained. “Parents volunteer to teach a weekly class in anything, really. This session we have arts and crafts, a writing club, ‘Fun with Food,’ knitting, to name a few. They’re all great.” Angela herself leads the outdoor adventures club. The men’s tennis team opted for chess club. They travel to Crocker Farms once a week to teach skills and supervise matches, rotating which players attend the club weekly. Teams that are interested in getting involved with this after school program are encouraged to contact one of the Athletics Liaisons (their contact information is below). It’s a once-a-week commitment from 1:20-2:30 p.m. on Wednesdays, and teams can either offer to lead a pre-existing club or pitch their own idea. The next session is from Feb.29-March 28. Reilly Horan ’13 is one of three Athletics Liaisons for the Center for Community Engagement. Athletics Liaisons connect athletes and coaches to the resources of the Center for Community Engagement and work to create a sustainable culture of service within the Athletics Department. If your team is looking for community engagement projects, contact Roshard Bryant ’13 at rbryant13@amherst.edu or Irene Hickey ’13 at ihickey13@amherst.edu. If your team just completed a community engagement event, contact Reilly Horan at rhoran13@amherst.edu so that the campus becomes more aware of what your team is doing to get involved. I was there. The girls on the baskeball team encouraged all the students to not give up on any dream, I play basketball, and heir speech really excited me for college. I would like to say thank you for coming.